There are few areas of learning and scholarship that haven't been touched by Sir Isaac Newton (1643-1727). And while you've probably heard some of the colorful stories (that he served in Parliament, but never spoke a word except to ask that a window be closed, he may have invented the cat flap, etc. ), here are a few things you probably didn't know about the founder of modern science. Newton was a man of great ego and great temper, and had few close friends. His dispute with German mathematician Gottfried Leibniz over the invention of infintesmial calculus is the stuff of legend, but Newton's less famous academic feuds were both bitter and many. 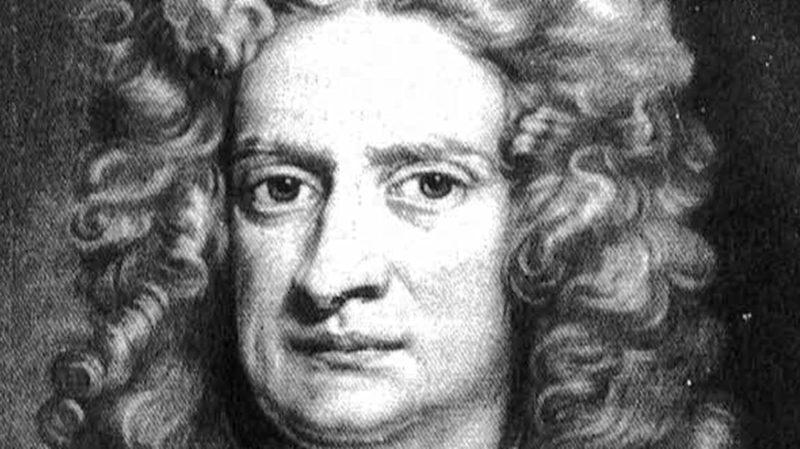 His fellow scientists John Flamsteed, Robert Hooke, and Henry Oldenberg were just a few of those who at times felt the sting of Newton's viciousness. Sir Isaac's most famous quotation may well have been an exercise in sarcastic, spiteful anger. In February 1676 Newton wrote to Hooke "if I have seen further it is by standing on the shoulders of Giants." Often taken as a sign of Newton's great humility, this famed quote was almost certainly intended as an insult to Hooke, who was hunchbacked and may have suffered from a form of dwarfism. Newton's father died before he was born, and his mother, Hannah Ayscough, remarried when he was three, leaving him in his grandmother's care. Young Isaac hated his stepfather. He also had a troubled relationship with Hannah, confessing in his journal that he had once threatened to burn the house down with the couple inside. Later in life, Newton desperately sought his mother's approval, but she was bewildered by his scientific successes. In fact, she would have preferred it if he'd stayed home to manage the family estates. It may be for this reason that Newton never married; it's believed by many that he remained celibate throughout his life. Newton was born into a Puritan-leaning Anglican family. By the time he was thirty, however, he was a secret heretic. While Newton was a deist and believed fiercely in a single God who created the universe and its natural laws, he could not reconcile traditional Christian trinitarianism with reason. Although he conformed outwardly with the Church of England for the sake of his social and academic positions, most scholars agree that Newton believed in Arianism - an ancient, virtually extinct Christian sect that denied the equal divinity of Jesus and God. Newton believed that worshipping Christ was a form of idolatry, and denied the existence of the Devil. Ironically, Newton was buried in Westminster Abbey - the spiritual heart of the church whose doctrines he rejected, even though he refused the sacrament on his deathbed. Unlike many intellectuals, Newton was famously dextrous and could work skillfully with metal, wood and glass. He constructed, among other things, his own telescopes and even the tools with which he made them. The development of these skills was probably spurred on by his arrogance. In old age, he confided to his friend John Conduitt that he he made his own tools because "if I had stayed for other people to make my tools and things for me, I would have never made anything of [my theories]." In 1696, Newton was made warden of the Royal Mint, and promptly set about recoining Britain's currency. He quickly found to his dismay that 20% of the coins taken into the Mint during the recoinage were counterfeit. Newton conducted an investigation, had himself appointed a justice of the peace, and successfuly prosecuted 28 people for counterfeiting, a capital crime. He famously put the coiner William Chaloner on trial a second time (Chaloner had used his powerful friends to secure acquittal the first time around). After his second trial, Chaloner was put to death, but don't feel too badly for him - he had made his fortune by setting up fake Catholic conspiracies, entrapping Catholics into revealing their beliefs and turning them over to the government for prosecution. The image of Newton as hyperrational man of science is somewhat difficult to reconcile with some of his extracurricular activities. In addition to his more respectable scientific pursuits, Newton was a student of alchemy and the occult. He conducted numerous experiments attempting to create the mythical Philosopher's Stone, a substance that could be used to transmute base metals into gold and create an elixir of immortality. His experiments with mercury may have led to the eccentricity that characterized his later years. Newton was obsessed with eschatology, the study of the end of the world, but was positive the end would not arrive prior to the year 2060 (many of his contemporaries believed Armageddon was much more imminent). He may also have been a member of the Rosicrucians, a mystical secret society. Fans of The Da Vinci Code, however, are sure to be disappointed; the Priory of Sion, and Newton's leadership of it, are based entirely on modern forgeries.